Seymour H. Hutner, a founding member of the Society of Protozoologists, has served the Society in many capacities, including President (1961-62) and member of the Board of Reviewers of The Journal of Protozoology. 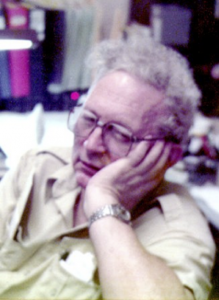 In 1976, The Seymour H. Hutner Fund was established by his friends and colleagues in recognition of his long service to the Society of Protozoologists and his outstanding efforts to foster creativity in young scientists. The endowed Fund provides a cash prize, THE SEYMOUR H. HUTNER YOUNG INVESTIGATOR PRIZE, given to a member of the Society who is not more than 15 years beyond the Ph.D. or equivalent terminal degree for his/her outstanding contributions to the “cutting edge” of some area of protozoology. The prize-winner is asked to deliver a special lecture at the annual meetings of the Society. Seymour H. Hutner was born in 1911 in Brooklyn, New York, whose shore and tidal marshes receive sewage and petroleum wastes that promote a patchy rich ecosystem. With his physician brother’s microscope, young Seymour and a friend examined their collections (even towing a home-made plankton net from a rowboat) from the area. Later (1927-31), as a student at City College (now City University), he found that similar estuarine and freshwater forays added zest to courses he took from enthusiastic naturalists Joseph Copeland (Blue-Greens of Yellowstone), Herbert Ruckes (Strain-and-Stress in Evolution of the Tetrapod Pelvis), and William Brown (Red Extreme Halobacteria ). In 1932, as a graduate student at Cornell University, he fell under the sagacious sway of H. D. Reed, whose specialty was amphibian morphogenesis (but was prone to brood about how algae related to the primordial animals, the Protozoa). In 1937, Hutner defended his Ph.D. dissertation on the “Nutrition of Lactic and Hemolytic Streptococci.” He also did a thesis in a minor field of concentration, biochemistry, which helped J. B. Sumner (Nobelist, co-discoverer that enzymes were proteins) know whether the prophyrin in his crystalline catalase was heme (catalase met the heme requirement of Crithidia fasciculata sent by André Lwoff, discoverer of its heme requirement). Another minor was botany. Advised by the cytologist L. W. Sharp, he took a cytogenetics course from Barbara McClintock and Harriet Creighton. Guided by E. F. Hopkins, the physiologist who used citrate as a chelator to identify trace elements needed by Chlorella , thereby demonstrating the essentiality of manganese, Hutner began studying Euglena gracilis. During his graduate years, Hutner spent an interlude (1935-36) mainly at Harvard and MIT with a team formed by Caryl P. Haskins (geneticist, entomologist, biophysicist) and Franklin S. Cooper (physical chemist, electrical engineer) to examine why x-rays killed. The team was sponsored by the newly formed Haskins Labs. They found that x-ray killing was investigatable with Penicillium spores serving as targets of the induced photoelectrons; the cellular target(s), however, eluded identification. Dr. Hutner spent several postdoctoral months at Cornell’s Veterinary College using protozoological diagnostic methods that led to the elimination of the abortion-eliciting Trichomonas foetus from dairy herds. He became familiar with the newly recognized Lactobacillus-like bacterial pathogen of sheep, Listeria monocytogenes, initiating his interest in macrophage growth factors. He also studied the swine pathogen Erysipelothrix, which eventually revealed a need for oleate and thus introduced Hutner to lipids of microorganisms. The next 2 ½ years were spent at the New York State Health Department, Albany. He was given various assignments from production of purified diphtheria toxin to quantifying the complement-fixation test for syphilis. Because poliomyelitis then raged, Hutner volunteered to isolate the polio virus from sewage. Having spent much time riding the New York subway, he had prided himself as being hyperimmune. Rejoining Haskins Lab in 1940, he and Paul A. Zahl collaborated for many years on studies of gram-negative bacterial endotoxins that induce capillary hemorrhage, sometimes curing the transplantable sarcoma 180 of mice. Hutner began to suspect that all organisms repair traumatic or chemically induced cell injury. Haskins Labs, then and 30 years after, was in an old factory building in mid-Manhattan, accessible by a freight elevator. Later, it became part of Pace University and moved into more conventional facilities. Luigi Provasoli from Lwoff’s lab at the Institut Pasteur joined the Haskins Labs. When Roger Stanier and Van Niel marshalled evidence of the profound gulf separating prokaryotes and eukaryotes, it rekindled Hutner’s hope that protozoa, the phagotrophic protists, might be favorable objects for seeking out the attributes undergirding “animality.” Provasoli’s isolates and friendship with E. G. Pringsheim (Ochromonas danica was a Christmas present from Pringsheim) provided several pure cultures of key organisms to examine. These results, along with others, were assembled by Hutner and W. Trager (editors of “Growth of Protozoa”, 1953, Annals of the New York Academy of Sciences). Hutner, together with J. J. Lee and E. C. Bovee, co-edited the Society of Protozoologists’ compendium, An Illustrated Guide to the Protozoa (1st ed.). In more recent years Hutner looked for connections between antiprotozoal and anticancer chemotherapies, spurred by a notion that chemotherapy is “applied phylogeny.” He hoped to identify “stress factors” that would eventually help ease the stress of chemotherapy and identify cellular targets for chemotherapy. Hutner kept a noisy, sometimes chaotic lab full of strange people and, to some, stranger microbes. He spent six full days/week at the bench, but each year he took the time to produce original Christmas cards as an outlet for his artistic talents. These he sends to colleagues and friends who cherish each of them. He is probably best known for his conversations (monologues), which are full of ideas, creative, and marvelous syntheses of information from various academic and nonacademic worlds, from the latest on Wall Street to inventing new lab techniques. Colleagues and students developed and sharpened their own skills by witnessing his verbal aggressiveness and onslaughts: Provasoli, in describing Hutner’s technical skills, referred to him as “the Mozart of the pH scale.” M. Levandowsky and J. O. Corliss described “the pundit of Haskins” as a harlequin and his accomplishments, publications, and conversations motley. Hutner “can spread thick layers of learned speculation – intellectual mulch, so to say – with the best of them; he has produced some very rococo concatenations of fact and fancy in his day.” Hutner, the “protozoology missionary” (G. Holz’s description), lured a continuous stream of talented young people, including high school students, from the streets of New York into the lab, made them peer down a microscope, and launched their careers with lessons on clean glassware and exact measurements. Hutner not only recruited and insp ired students but also felt strongly about paying tribute to exceptional young researchers. The Seymour H. Hutner Young Investigator Prize is a direct result of that desire. [Excerpted from Hutner’s “abbreviated C.V.,” which has more charm than a “random page of the Pittsburgh phone directory,” M. Levandowsky; Corliss, J. O. 1977. J. Protozool., 24:481-483; and Society of Protozoologists’ archival documents. ].